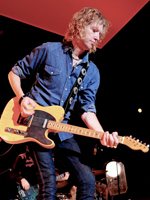 For more than ten years, Peter Stroud has been the lead guitarist with Sheryl Crow, having since assumed role of music director for her band – and co-writing songs such as “Hole in My Pocket”. Stroud initially gained international attention as guitarist with Seattle artist Pete Droge, whom he was introduced to by Atlanta-native producer Brendan O’Brien. He also toured with Don Henley in support of Don’’s album release, Inside Job. The tour is documented on Henley’s live performance DVD, Inside Job 2000. Touring with these artists has taken Stroud worldwide performing clubs, theaters, arenas and in front of festival audiences of 250,000. He has made countless television appearances, including Saturday Night Live, Letterman, Leno, Conan and the GRAMMY’s. His other recording credits include Stevie Nicks, Dixie Chicks, Wallflowers, Shawn Mullins and Michelle Malone. Stroud is also the co-founding partner of 65AMPS, a manufacturer of hand-made guitar amplifiers. He has extensive experience recording music for television and radio commercials and film scores.